Mazda’s powertrain team has brewed up a fancy new engine that, like a diesel, uses compression to activate the combustion process. In a press release on the new tech, Mazda tells us just how staggering the benefits of this “world’s first” technology might be. Set to debut in 2019, Skyactiv-X is Mazda’s next-generation engine that uses Spark Controlled Compression Ignition. In other words, it’s a homogenous charge compression ignition engine sometimes, but it seamlessly changes over to a regular spark-ignition engine under certain engine operating conditions. Mazda says the new tech “combines the advantages of gasoline and diesel engines to achieve outstanding environmental performance, power and acceleration performance.” And if those words aren’t good enough for you, Mazda’s thrown out a few numbers. Together with a supercharger, the compression ignition engine can allegedly yield 10-30 percent more torque than the existing Skyactiv-G engines. 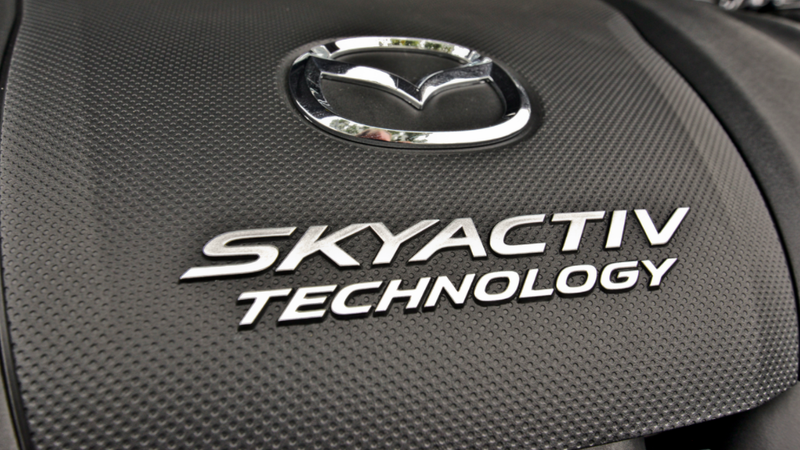 Granted, the existing Skyactiv-G motors are naturally aspirated, so you’d expect more torque, here. Compared with Mazda’s 2008 engine that had the same displacement, the new motor promises a whopping 35-45 percent more efficiency. Perhaps even more impressive is the fact that the purveyors of Zoom-Zoom claim the new engine’s fuel efficiency “equals or exceeds” that of the latest Skyactiv-D turbodiesel engine. Mmm, Diesel-like fuel economy. Yes, please. The whole concept of homogenous charge compression ignition has been around for a while, but its implementation in commercial applications has been thwarted by the difficulty of controlling exactly when combustion occurs. With gas engines, spark plugs activate combustion, and with diesels, fuel injection is what sets the controlled explosion off at the right time. With an HCCI engine, there’s no single “lever” to adjust in order to control autoignition. And everything from ambient air temperature and pressure, fuel quality, air-fuel ratio, turbocharger boost, engine speed, engine load, and valve timing can affect exactly when this combustion occurs. This means Mazda’s new engine will have to carefully dial in some of those parameters to adjust for the variables it cannot control. And sometimes, it will have to forgo compression ignition entirely, and just use a spark plug. My guess is that Mazda’s engine is really a spark-assisted HCCI engine that uses a regularish port or direct injection spark mode during transients, high load, or other non-ideal conditions and only goes into HCCI during relatively steady state low load conditions (cruising or idling when environmental conditions are within planned/measured parameters). In its release, Mazda does say the new tech offers “high efficiency across a wide range of rpms and engine loads,” and it would only make sense if that “wide range” covered normal, low-load driving conditions that most of us see day-to-day. While I’m not an expert on homogenous charge compression engines, all of of this seems to makes sense. The more I read up on this tech, the more I get excited about its implementation in an actual production vehicle. Mazda will tell us more about their new engine tech before the Frankfurt Motor Show later this month, and I’ll be there with a pen and a TI-89 ready to get nerdy.